THE CREATOR OF THE FACE OF BOND? My Father is alive and well and living in the countryside in an idyllic spot, overlooking hundreds of acres of open farmland, the area where I was brought up with my brother Sean. A perfect setting. This may never have come about if Dad hadn't been asked by the Daily Express Newspaper to develop a new strip cartoon series with them. This was to be the beginning of the Bond Legend as we know it today. He likes to take things very easy now, a big difference from those days of producing so many incredible strip cartoons. 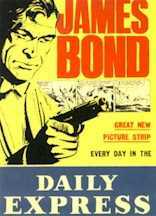 In 1958 the very first Bond strip cartoon was formulated. Dad carefully developed a face for this inimitable spy, James Bond and began the drawings for the adaptation of the Fleming story, 'Casino Royale'. This series of strip cartoons was first published in August 1958 and ran until the December of that year. It was an instant success and was responsible for increasing the newspaper's sales. Bond, as we know and love today, was born! My Father said once, when he had submitted the first drawings of Bond, he had no idea how much of an impact they would be when blown up to enormous proportions and spread all over London on the big hoardings! This was the start of a long and interesting relationship with 007, for Dad. My Father first started drawing Bond from our home in London. It was a small ground floor studio flat, just off the Earl's Court Road, with a raised balcony in the main living area for a workspace. Luxury! I was only a little lad then and had absolutely no idea as to what my Father was up to every day with his pens and pots of ink, tone sheets, artboard etc. My Mother, Sheila, had just finished working as a Costume Designer in the film industry in order to bring up yours truly and now it was down to Dad alone to bring in the family income. My brother Sean was born in 1959 and we all lived together in this flat until our parents managed to obtain the most incredible, unrepeatable bargain of a country property. Half an acre, four cottages at one end and another three cottages at the other end. The four cottages became one large house and the three cottages became an artists' studio for my father to work in. This became our home for many years. Quite a difference from London. I can remember my father having to virtually lock himself away for hours on end in his studio to produce the volume of work necessary to keep Bond appearing daily in the newspaper. He would emerge for breath and a meal or two on occasions and then submerge to finish his target for the day. My Brother and I would play, go to school, come home from school, bring friends back and thoroughly enjoy ourselves whilst Dad was slaving away over his drawing board! I can remember sometimes going up to his studio to pay him visits. I suppose I wanted to remind myself that this figure, with a green eyeshade, bent over a drawing board with a single anglepoise lamp, was indeed my Father. I would watch the Bond work being composed and inked in, amazed at the skill and dexterity of Dad. I was unaware as to just how much experience he had at the time. (In later years, after Bond, he went on to draw cartoons for 'T.V. Comic' [Laurel & Hardy, The Keystone Kops, Pink Panther and many other characters], 'Look & Learn', children's television programmes like 'Hatty Town' & 'George The Dragon'). Was there no end to this man's capabilities? Well no...he in past years has become a fully fledged Punch & Judy Professor! The amount of work and meticulous attention to detail that Dad put into his drawings was amazing. He observed, he noted, he collected references, he studied everything which could possibly help in producing some of the finest comic art. Each day he would bring his finished Bond strip cartoon panels back to the house and show my brother and I so that we could comment and pick out any flaws that weren't immediately obvious to the trained adult eye! (I'm sure that my mother would have made the most sensible observations). However, Dad would take everyone's comments seriously and make alterations if necessary. He would be fine tuning his work right up to the point of sending it off for publication. I have a feeling that my brother and I were responsible once for helping James Bond out of a sticky situation with a toy Luger Pistol. Dad needed a reference for this particular weapon quickly and had nothing to hand in his archives. (He had just about everything else but Lugers, no). Sean and I had just the answer. We extracted a toy Luger Pistol from our toy box and loaned it to Dad. (In those days a great deal of attention to detail was given to manufacturing toy guns and it seemed the perfect solution to us at the time). The moment arrived later for us to inspect his work and Dad produced the strip cartoon panel. The first thing my brother and I asked was why a toy cap gun was being brandished in such a serious situation. "What do you mean?" asked Dad. It was pointed out to him by his critics that the little pop-up hatch for the roll of paper caps had been drawn in! Back to the drawing board for some white touch up ink and Bond was saved from a seriously embarrassing moment in his career as the number one spy! It has been said by more than one person that it is quite possible that my Father's face of Bond may well have been responsible for a certain Mr. S. Connery obtaining the position of 007 for the first film. Denied by some but you cannot get over the uncanny resemblance, can you? The first film was not made for a number of years after the first strip cartoon was published. I heard a story once which may well be true. Sean Connery, appearing in a theatre production, was sitting in his dressing room with another fellow actor who was reading a copy of the Daily Express. This gentleman remarked to Sean how he felt that he should play the part of Bond as he looked remarkably like the face in the strip cartoon. Well, the rest is very apparent! (Shimply shtunning I might shay!). For many, many years, both my parents had a very good friend who worked in the film industry. Her name was Freda Pearson, a delightful Polish lady. She can be seen on the titles of a number of Bond films as Set Dresser. An incredibly important role as she was totally responsible for making each scene look just right. She would work very hard in making sure that what we see today in those memorable pictures looked absolutely correct. I believe that at one time she even made the film crew eat most of a meal and leave the table part finished to make the particular scene work! I remember that after she had finished on some of her films, she would be able to obtain some of the props and furnishings for a very low cost. Many items were unwanted by the film company at the end of the pictures and had to be disposed of. Freda, and I am sure many other people associated with the films, would be able to buy for next to nothing, all sorts of items. Freda would contact my parents and offer them the opportunity to buy these ex Bond Props direct from the film company! We seemed to acquire a bit in the way of props and furniture. We bought several poolside chairs, tables and sun loungers from 'Goldfinger', a low aluminium and wood table from 'Dr. No', an enormous heap of wood panelling in strips from one of the 'Goldfinger' sets and other items which I am unsure about now. I believe that The James Bond 007 Fan Club & Archive are now the proud owners of the 'Goldfinger' furniture which previously adorned my Father's garden! Freda, I seem to remember, managed to furnish most of her flat from Bond items! She also once offered me the opportunity to by some complete scuba diving kits, aqualungs, wetsuits etc for �5 each!. 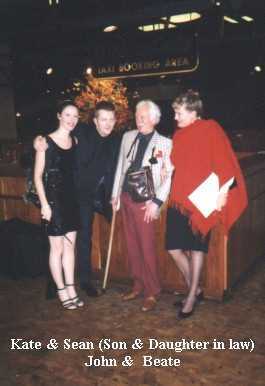 Dear Freda, she passed away many years ago, a lovely lady with a heart of gold. Dad is finding the interest, shown by so many people in his work, rather exciting. He is so pleased that there are many people out there, young and not so young, who enjoy reading his strip cartoons. He has many good friends and a large family. What more can a man want? 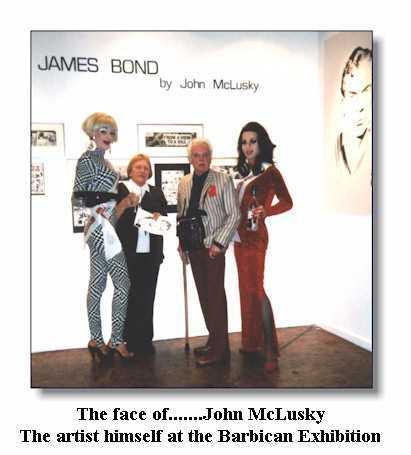 Well... how about a prestigious Exhibition of his Bond Artwork at the Barbican Centre in London? My Brother Sean and his Wife to be, Kate, organised this splendid exhibition of Dad's work at the Barbican in London. 'The Face of James Bond'. 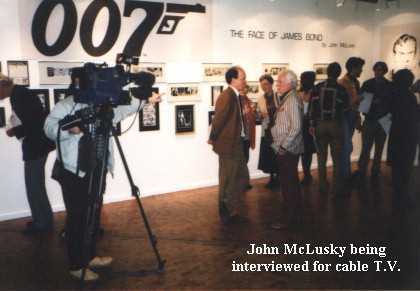 An exhibition of original Bond Strip Cartoon Work by John McLusky. It took place from 25th November 1995 to 14th January 1996. 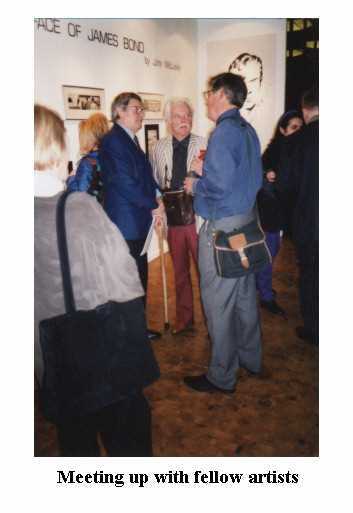 There was a press and private view on the Tuesday 28th November during the evening. What an evening that was. 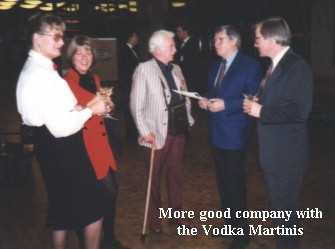 Smirnoff Vodka sponsored the show and plenty of Martini's, shaken not stirred, were downed by a considerable number of people! It was a marvellous exhibition and Dad revelled in it all. Lots of friends turned up for the private view, he was interviewed on T.V., the atmosphere was more of a big party and a reunion. My heartfelt thanks go out to my brother and Kate for producing such a memorable moment for Dad. So professionally produced and presented. He will never forget that. It was here at the exhibition that Dad started to find that people were becoming interested in buying his work. He sold some to a number of collectors and now through myself, Graham (his Agent) he is offering most of his original cartoon strips for sale. Using my own Web Site for my lighting design business, by adding on some extra pages for Dad, I am able to give you an idea as what is available for sale. I am advertising in magazines here in the UK and over in the States and am letting out as much info as possible on the web. http://www.treeble.demon.co.uk is the address. You can skip all the bits about me and go straight through to the Bond Information Pages by adding /bondart_original.htm to the end of the address. Isn't technology amazing?